Bayard Rustin, “Bayard Rustin ,” Histories of the National Mall, accessed April 23, 2019, http://mallhistory.org/items/show/126. Rustin was a crucial force driving civil rights activism, especially in organizing protests on the National Mall. The first March on Washington movement emerged in 1941 when African American activists, including Rustin, successfully pressured President Franklin D. Roosevelt to end racial discrimination in federal hiring. By threatening to march in Washington during World War II, Rustin and his colleagues changed federal policy without needing to march. In 1963, Rustin was a pivotal organizer for the March on Washington for Jobs and Freedom. Rustin remained behind the scenes during the event on the Mall, but he was recognized as co-organizer with A. Philip Randolph on the cover of LIFE Magazine. 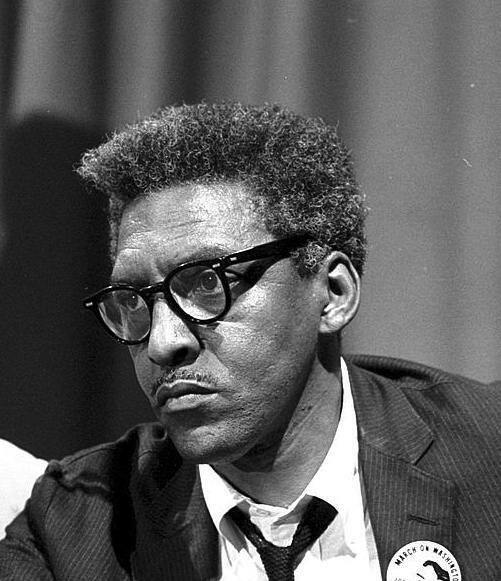 Born in West Chester, Pennsylvania in 1912, Bayard Rustin was raised by his grandparents. He attended the African Methodist Episcopal Church with his grandfather and Quaker Meeting with his grandmother. Rustin's grandparents were active members of the National Association for the Advancement of Colored People (NAACP), which meant that as a child Rustin met civil rights activists and advocates, including W.E.B. Du Bois. After taking classes at both Wilberforce University in Ohio and Cheyney State Teachers College in Pennsylvania, Rustin moved to New York’s Harlem neighborhood and earned money as a singer. He studied at the City College of New York and by the late 1930s, he joined the Young Communist League because of the Party’s commitment to civil rights for African Americans. Rustin left the Communist Party following the outbreak of World War II and shifted his political activity to the Socialist Party where he met A. Philip Randolph. In 1941, Randolph and Rustin led an effort to march on Washington in protest of racial discrimination in the defense industry. Randolph cancelled the march after President Frankin D. Roosevelt signed Executive Order 8802 requiring equal access to federally-funded defense jobs. In 1942, Rustin advised James L. Farmer, Jr, George Houser, and Bernice Fisher, as they founded the Congress of Racial Equality (CORE). As a pacifist, Rustin opposed World War II and never registered for the draft. He was arrested in 1944 for violating the Selective Service Act and served 28 months in prison. After his release in 1946, Rustin continued to work for racial justice while practicing nonviolent civil resistance. He participated in a 1947 effort to integrate public transportation in the United States, travelled to India in 1948 from associates of Mahatma Gandhi's techniques in non-violence resistance. In 1953, he was arrested in California for homosexual activity. At the time, homosexuality was illegal in many US states. Rustin was not outspoken about his sexuality, but he also never denied that he was homosexual in order to avoid prosecution. This arrest as well as his brief membership in the Communist Party were often used to discredit him, his work, and his causes. Concerns about Rustin's vulnerability to criticism meant that other civil rights leaders often wanted his involvement in specific actions to be anonymous. For example, although he was instrumental in organizing the 1963 March on Washington for Jobs and Freedom, some of the March's leaders said that he should not receive any public credit for his work in case it endangered the March.